(and by implication a MacIlvain) without a shield. The Gaelic 'Ban' or Bain means ‘fair’ and with Scottish blood made up with so much Norse and Germanic stock this descriptive term could have been applied to many people. Indeed the name is found associated with several clans in many districts. There was an early Scottish King called Donald Ban. Through various Gaelic manipulations the three forms of the name have become MacBean, McVean and MacBain. One of Anton's Scottish lines is the MacIlvaines of Carrick, the Lords of Grimmet, who held Thomaston Castle for nearly a century. 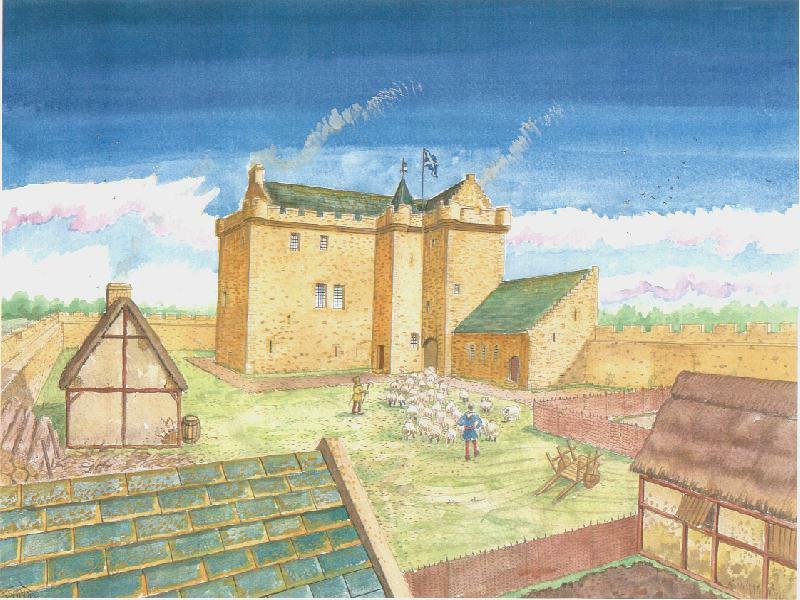 Above: An artist's rendition of Thomastoun Castle as it looked in the 16th century, when Anton's 13th Great Grandfather Gilberto M'Ilveyne and his wife Jonet Corry of Kelwood, the Lairds of Grimmet, lived here. Thomastoun Castle is located close to Maybole and Culzean Castle in Ayrshire. Originally built in the 13th century probably by Thomas Bruce, a nephew of Robert the Bruce, it was later extended with a tower house in the 16th century when it was then owned by the Corries of Kelwood. It later passed by marriage to the MacIlvaines of Grimmet who held the castle for a century. In Abercrombie's "Account of Thomaston", the following description appears: The ancient castle of Thomaston, beautifully situated within sight of the Firth of Clyde, opposite Ailsa Craig, was acquired by the Makilvane family by marriage. The island of Ailsa Craig, 9 miles offshore in the Firth of Clyde. Anton's ancestors' castle overlooked this. The Lairds of Grimmet, some of Anton's ancestors (the McIlvaines), owned three estates: Attiquin, Grimmet, and Thomaston. The castle from which the Lairds took their name (Grimmet) was a fortress built of stone with moat and tower on the southwest side of a large valley overlooking the River Doon, and was as nearly impregnable as it was possible to make it in those days (ca 1200). It was situated in sight of Keirs castle, the home of the Shaws, with whom the Lairds had much in common, intermarrying frequently in succeeding generations. It sat on a fairly level site (possibly man made) overlooked by Grimmet hill rising several hundred feet above immediately to the south. In turn, the site provides a magnificent view of the entire Doon valley stretching for miles to the east and north several hundred feet below, overlooking the old Roman Road built at the time of the Roman invasion. About 50 miles north of Grimmet lie the "Bonnie Bonnie Banks of Loch Lomond." The mountain above Grimmet supposedly was the site of the signal fires which called the Clans together in times of need, particularly during the time of William Wallace, and Anton's 22nd Great Grandfather Robert the Bruce. The ancient lands of Grimmett is now a farm 1 1/4 miles northeast of Maybole: in Carrick. It's Gaelic name is GRIOM AT. "Griom," in ancient gaelic means war, battle. The word "At" indicates a swelling, protuberance, prominence, a hillock. So the literal translation of Grimmett is: The low hill of battle. According to Frank C. McElvain, NIGEL MACYLVEYNE lived from 1395-1465, and is credited by tradition with being the founder of the estates of Grimmet, although, as we have seen earlier, the family may have held estates in the area from a much earlier time. He is brought into the records in a confirmation of the lands of Grimmet and Attiquin by King James of Alan, son of Gilbert MacYlveyne in June 1529. This record confirms the tenancy of the family dating to the non-entry of Nigel. While no definitive relationship to Nigel is given, it is presumed that he was the father of Gilbert. It does not seem reasonable that the non-entry would have dated to a previous Nigel several hundred years earlier. Some authorities assert that Nigel was the son of a Gilbert MacYlveyne. Darrel Iwerks reports that King James I succeeded to the throne of Scotland in April, 1406, on the death of his father Robert III. James, then aged 7. had become heir to the throne four years earlier. In March, 1406, only a month before his death, Robert III decided that James would be safer in France, but the young prince was captured at sea by the English. King James remained a prisoner king in England for 18 years, while first his uncle Albany and later his cousin Murdac acted as Governors of Scotland. At last in December, 1423, a treaty was signed in London by which James was allowed to return to his kingdom in exchange for a large ransom, the payment of which was to be guaranteed by wealthy hostages. Twenty-seven of these were sent to England immediately but exchanges were made at regular intervals. Among those sent south in 1432 was Nigel MacYlvayne. The hostages were detained either at the tower of London or at one of the other castles, where they lived at their own expense with retainers and servants who were allowed to travel freely to and from Scotland. On the payment of the ransom, all returned to Scotland. Most authorities agree that Nigel had at least two sons Gilberto, who succeeded him as heir, and John. John was shown as a witness in Dumfries, 1477. He probably married a Miss Kennedy, sister of Gilbert Kennedy, Earl of Cassilis. There is some question whether this is the same John Makilvane who appears in court documents from 1503-1516. The later dates lead some researchers to believe that he may have been the younger brother or cousin of Alan. The Glasgow Commissariat October 15, 1515 cites John Makilvane et al for the slaughter of James Douglas, and he is mentioned in the records of Ayrshire and Carrick as early as 1503 and later in 1512, 1516, and 1524. He is not named in any of the early confirmations of the grants of Grimmet and Attiquin, either to Gilbert, Alan, Gilbert, or Patrick. In the PBGR (Protocol Book, Gavin Ros) # 1044 "Gilbert Kennedy of Kirkmichael, compearing in the Tolbooth of Air before Charles Campbell, Macer of the Sheriff of Air, in that part especially constituted in the cause of recognition between Gilbert and Allan M'Ylveyne, protests that whatsoever shall be done in said cause before said judge, shall not prejudice David M'Ylveyne, a son of Gilbert's sister, as to the right he has in the lands of Attiquin." The "young Laird of Attiquin" reported in records as killed in 1512 had been a Kennedy. It is possible that his interest passed to his sister, and from there, by marriage, to the Lairds of Grimmet. Gilbert took over the estates in 1484. This is shown in the charter of apprising, which states that "Gilbert M'Ylveyne had occupied and, intromitted the lands of Grurnet and Attiquyne, lying in the Earldom of Carrick and Sheriffdom of Air, for the space of 45 years." That takes the time back from 1529 to 1484. In his old age Gilbert M'Ylvane turned over the estates to his son, Alan, as shown in an order in the PBGR. According to Darrel Iwerks, records indicate that either Gilbert or his son Alan assisted in the Rescue of James III, who had been abducted from the custody of Bishop Kennedy of St. Andrews. The young King had been placed in the custody of the Bishop during childhood. Because of their assistance, the MacYlveynes were granted additional lands, probably an addition to Lower Grirmnet. Frank McElvain reports that the genealogist, Gustave Anjou names the wife of ALAN M'YL VEYNE as Marian Fergoussone. She was mentioned with Allan's daughter in law Janet Corrie in the register of the Great Seal May 30, 1530. These were particularly violent times, as indicated in the PBGR, June 18, 1526: " Alan Makilvane and ilk and other filled for reasonable slaughter of Unquhile (the late) Cornelius de Machan. Also Martin Kennedy and Gilbert Makilwraith were fined." It seems that Alan, Gilbert, the Earl of Cassilus and 233 others were involved in the slaughter. The Protocol Book, January 2, 1530 suggests that Alan M'Ylveyne of Grimmet gave bond for Gilbert Kennedy, and so he was released from penalty on promise of good behavior. According to the Scottish Record Society Publication, Vol. 28-34 " Allan Makilvene, Laird of Grimmet, along with Thomas Corry of Kelwood, David Crawford of Keirs, and others, was fined 100 pounds for not entering his friend, Gilbert Kennedy for participating in the slaughter of Robert Campbell of Lochfurgus, Alexander Kirkwood, and Patrick Wilsone. Robert Campbell, having a short time before killed the old Earl of Cassilis, father to said Gilbert Kennedy. Done July 28, 1528 at the Justice Court, held at Sterling . #1042 "Instrument narrating that Allan M'Ylvene promised to relieve and keep scathless Sir John Kennedy, Chaplain, and John Campbell, Tutor of Skeldoun, at the hands of Gilbert M'Ylvene of Grumet, concerning certain things committed to Gilbert by the said Allan, according to an agreement and communication verbally recited for the time. Done in the Tolbooth of Air, August 25, 1529. Witnesses, Gilbert Kennedy of Kirktnichale, John Kennedy, Alexander Mur and Sir John Campbell, Chaplain." #1043 "Instrument narrating that Sir John Kennedy, prebendary of Maybole and John Campbell in Over Skeldoune, became sureties and cautioners for Allan M'Ylvene that he shall do and fulfill all things communicated in word between him and Gilbert M'Ylvene, his father, namely that he shall make Gilbert his assignee in and to the fivemerk land of Attiquin for Gilbert's life-time, and that within twenty-four hours after Allan shall obtain the non-entry of the lands under the pain of 1000 merks and then he shall give security to Gilbert of the lands for life, Gilbert paying an annual rent to Allan ...(the writ is too defaced to get details)." Same date and witness as above. The dictionary gives the definition of prebendary as "a person, as a canon, who receives a stated income from the revenues of a cathedral. # 1044 is the instrument quoted earlier in which Gilbert Kennedy asks that the above agreement not affect his nephew's rights in the lands of Attiquin. # 1045 -"Instrument narrating that Gilbert M'Ylvene, cornpearing before said Charles Campbell, sheriff of Air in the Part, confessed he had occupied and intromitted with the lands of Grommet and Attiquin, extending to twelve-rnerk lands for the space of XLV quinque (45) years by past, and on being required to produce his sasine of the lands, if he has any, he declared that he had not for the time any evidence to produce." Same date and witnesses. # 1047.- "Instrument narrating that Allan M'Ylvene, having the non-entry of the lands of Grunnnete, in terms of letters from the king under the privy seal to said Allan, made and constituted Gilbert M'Ylvene, his father, his lawful assignee in and to the fivemerk lands of Attiquin, with pertinents, namely the four-merk lands he now inhabits and that merk lands of Gerygrun, inhabited by Nevin M'Clymyn, for life time, giving him power to intromit with, labour let and set the lands and receive the rents, transferring all right and claim from Allan and his heirs and to Gilbert and his heirs, and this because of paternal love, special favor and that he may freely obtain his father's blessing, chiefly because the said Gilbert is his father (pater carnalis) and now is aged, and if he (Allan) shall prosecute the premises to extremity, they may turn to Gilbert's utmost loss and irreparable injury; for which things Gilbert shall pay yearly during his lifetime the sum of twenty shillings. The granter binds himself to ratify what his assignee does in the premises, under obligation of all his goods. Done at Air 25 August 1529. Allan was listed as a juror on assize court in the bailliary of Carrick in 1532. GILBERTO M'ILVENE succeeded his father in possession of Grimmet and Attiquin. He had confirmation of Grimmet from Queen Mary 5-4-1546 as son and heir of Alan. Gilbert had several sons of whom Patrick is the only one proven. Other sons may have been David, Gilbert, Oliver, and Thomas. Some searchers believe that David was the heir, but that he abdicated in favor of Patrick, who married a Kennedy and was able to retrieve the family fortunes. Gilberto was a Colonel of horse and eventually died in the battle of Fawside near Edinburgh, September 18, 1547. His name is included in a list of the gentry who fell in the battle, as published by Paterson's "History of Ayr and Wigton." Hanna's History mentions Gilbert as "Laird Maclevens. The following excerpt from "Lion in the North", by Prebble, describes the battle "The Battle of Fawside was fought at Pinkie, six miles south-east of Edinburgh. When the French left Scotland after helping the Scots reclaim St. Andrews, eighteen thousand Englishmen came over the border under Hartford, now Duke of Somerset and Protector of England by his own making. Six thousand of them were cavalry and eight hundred of the foot were musketeers; There were fifteen pieces of heavy artillery, a thousand wagons, and an attendant fleet tacking up the coast. The return of an old and terrible enemy brought a brief and defiant unity to the Scots. On Black Saturday, September 18, 1547, Arran formed a battle-line of four divisions at Pinkie. The Scots had no musketeers, only spears and archers. Pride was again the greatest enemy of the Scots and would lead them to their own destruction. In five hundred years the number of decisive battles they had won against the English could be counted on one hand, leaving a finger or two to wag in caution. Pride and over- confidence had lost them the rest, and it would be so again." Reg. Sig. Edinburgh, Vol. I, pg 136 is an extract of the passing of the lands to Patrick heir of Gilbert McIlvane de Grumet, his father, who died under his Majesty's Banner in the Battle of Fawside. Three-merk lands of Nether Grumett and Three-merk lands of Ovir Grumett 6 merk, I pound, 6s, 8d lands of Attiquin in the Earldom of Carrick. Dated Oct. 25, 1547. In 1548 the Exchequer of Rolls of Scotland, Vol. 18, pg 438, shows certain concessions made on monies due on death of those killed in battle of Fawside. Patrick had been granted the lands, as noted above, but by this document life rent of 3 merklands of Net11er Grommet were reserved to Janet Corrie, Patrick's mother, widow of Gilbert. Life rent was given to Allan Makelayne, his grandfather, of the 6 merklands of Attyquin and freehold rights to Mariote Ferguson, wife of Allan, in certain lands. PATRICK M'ILVANE succeeded his father, Gilbert, October 25, 1547, and became Laird of Grimmet for the years, 1547 to 1613. The estates at this time included Upper Grimmet, Lower or Nether Grimmet and Attiquin. The records of Frank McElvain list the children of Patrick and Isobel Kennedy as John (m Jane Corry), Patrick (m Jane Forrester 12-4-1615), Thomas, David, and Alexander. Thomas was alive in 1617 (Glasgow Commissariat). PBGR mentions Patrick apprenticed to William Haliburton in Edinburgh (probably son of Patrick and Jane Forrester.) A decree of absolution on record at Holyrood, February 1592, made by the Privy Council in favor of John, Earl of Cassilis, names five Mcllvanes Patrick Mcllvene, elder of Grimmet, John Mcllveanne of Grimmet, younger, John Mcllveanne of Auchenharrie, Gilbert Mcllveane, Flesheur, in Maybole, and David Mcllveane, Flesheur in Maybole. The word 'Flesheur" refers to the retailing of meats, or the flesh of animals for food. Other records indicate Alexander, whose will dated August 1, 1620 made him a resident of Ballantrae. At Holyrood House, Edinburgh, 22 Feb. 1597, a document was signed by King James VI confirming the lands as follows "The King as administrator, etc., confirms to one Patrick Mcllivane of Grumet (from whom Isobella Kennedy, his wife, is conveyed a life estate) 21/2 measures of land in the Manor of Lower Grumet and 1/2 measure of land adjacent, called Willistoun (occupied by J.C. McClymouth) according to the old survey also to John Mcllvane his son and heir apparent, and to his male heirs whomsoever, 6 measures of land of Grumet, 6 1/2 measures of land of Lower Grumet, and Attiquin, with their mansions, houses, fisheries and woods in the County of Carrik, called Air, excepting reserving to the said Patrick the free use thereof and may redeem these lands from the said John by paying five pounds at the parish church of Maybole on 40 days warning. Held of Henry I, Lord and Seneschal of Scotland and Earl of Carrick. In the Register of Sasines for 1601, Patrick's wife is referred to as "Isobel Kennedy, Lady Grymett". This has given rise to all sorts of speculation. Torrence and Allied Families declares that "Sir Patrick was knighted for bravery on the field of battle". What battle is not told. It seems much more likely that Isobell brought the title of "Lady" with her. One source says she was the widow of Kennedy of Knockdon. Since the use of the title after the name denotes a widow, it seems fairly plain that is all it means and had nothing to do with Patrick, no matter how brave he may have been. On May 19, 1553, Hugh and David Kennedy came with 100 followers with jacks, spears, and guns to the Parish Kirk of Kirkoswald and the College Kirk of Maybole, and abused the sacrament of OHaly Kirk", (The elements of the Mass and other sacred items. ) The Earl of Carrick was quick to respond, and a number of persons had to give caution (bond) afterwards to the extent of 3,000 Pounds for their future good Behavior. At about the same time, one of the Kennedys living at Dunure tried to seize the lands of Crossaugel Abbey. He tried to persuade the person responsible for the deeds to turn them over by slowly roasting him over a fire. He survived the roasting, but did not turn over the deeds. The Lairds of Grimmet were involved in a particularly bitter feud between the Kennedy Earls of Cassilis and their cousins, the Kennedy House of Bargany, which reached its most intense fury between 1569 and 1602. It climaxed with the kidnapping of the Countess of Cassilis as she returned to Ayr from a visit in Galloway. She was escorted as she travelled by various members of the family and friends, among whom was John. "the young Laird of Grimet". Pitcairns History of the Kennedys is quoted The Laird of Dramurchie (Thomas Kennedy, brother of the Laird of Bargany) besieged the House of Auchinsull and took prisoners the Countess of Cassilis and the young Laird of Grimak and Quentin Crawford. A fatal encounter took place between the Earl of Cassilis and the Laird of Bargany (Gilbert Kennedy) in which Gilbert Kennedy's "Horse was slain and the Earl's bridle was shot in two, whereby his horse cast him and struck his arm out of joint. The young Laird of Grimak was stricken through the chin and he and his horse both strucken to the earth. This wound was almost certainly not fatal, as is sometime reported, for John appears in several records after this date. In 1602, the Register of the Privy Council shows an order by the king for Lady Bargeny to put at liberty Hew, Master of Cassilis, McIlvane younger of Grumet and others "lately apprehended by Thomas Kennedy of Drummurchie and his accomplices". According to Robertson, Thomas Kennedy had taken the prisoners to the family castle and turned them over to the care of his mother, Lady Bargany. Hew Kennedy had been wounded, as well as John McIlvain, and she supplied the nursing. Later in 1602 the king issued a Decreet of Absolvitor concerning a retaliation by the Earl. "By the Privy Council in favor of John, Earl of Cassilis and others for 'convocation of his highnessO lieges, and bearing and wearing of jacks, steel bonnets, corslets and lances, hackbutts (?) and pistols, breaking of his highness' peace'." It goes on to say "That where, upon the elleventh day of December instant, Johnne, Earl of Cassilis, John Corrie of Kelwood, Hew Kennedy of Penqhuirry, John Davidsoun of Penny glen, Oliver Laird of Culleinzie, Patrick Mcilveane, elder of Gremmat, Johne Mcilveane, younger of Gremmat ... Alexander Schaw, tutour of Gremmat to be warned by the laws of this realm and Acts of Parliament come in hostile and warlike manner furth the town of Mayboll, and lay at wait for Gilbert Kennedy of Bargany, his freinds and servants, as they were coming the highway from the burgh of Air towards the said LardOs own dwelling house, and invaded and persued them of their lives". There follows a description of the battle, saying t11at a number of firearms were discharged and a number of Bragany's company were "hurt and wounded". And more to the point, Gilbert of Bargany was slain. Again the tone of the complaint was not so much the doing in of Bargany, but it has a rather plaintive ring as it goes on "they have .broken his highnessO peace in that COU11trey; whereby many inconveniences are like to fallout, to the trouble and disquieting of the whole country, without remedy being provided. " The Earl of Cassilis and everyone concerned with the fracas were slapped on the wrist and told that, since they admitted to disorderly conduct and promised to keep "his highnessO peace and keeping of good rule and quietnes in the country hereafter, under the pain of rebellion ", no further action would be taken. Also in 1602, the Privy Council issued bonds which guaranteed that Patrick Mcilvaine of Grumet and his son, John the Younger of Grumet, would not "intercommune" with Adam Boyd of Pinkhill during his rebellion. In 1604 bonds were again issued against Patrick and John not to harm James, Earl of Moray, his tutors or curators. In 1604 there was a summons of treason against Thomas Kennedy of Drummurchie and Walter Mure of Cloncarde for murderous attacks on the Earl of Cassi11is who, with John McllVane younger and others, was taken prisoner and incarcerated for 15 days. Other records of Patrick McIlvane include signing as a witness in a deed, January 4, 1586, an he was a witness to a caution by John Kennedy, 1608. Patrick died in November 1613. His testament dative (will) is recorded 15 June, 1615. JOHN MCILVANE succeeded his father, Patrick, as Laird of Grimmet in 1613. By marrying Jane Anne Corry (also spelled Corrie), he brought Thomaston Castle and estate into the family. Thomas Corry de Kelwood, had a charter from James IV dated 12, January 1507, for the lands of Thomaston and several others. He had a charter from James V in 1517 for the lands of Newly and Clonlothry .Thomas Corry , along with David Crawford of Keirs, was fined 100 pounds for not entering Bargany for the slaughter of the young Laird of Attiquin in 1512. The lands of Thomaston passed eventually to George Corry of Kelwood, who was served heir to his father, John, on 30 March, 1610. In George's will, it states that his son having died, his daughter Ann was heiress. The heads of the family retained the title of Laird of Grimmet but always thereafter lived at Thomaston. For more information about Thomaston Castle, click here. "In November last, Jolm Kennedy of Blairquhan on the one part and Johnne McIlvalle of the other part of Grinunet, having raised a tumult in the town of Maybole, the said Earl, as one of the members of His Majesty's counsel. ..had attempted to pacify the same and had ordered the rioters to disperse. The said Jolm Kennedy had obeyed most willingly, but George Corry of Kelwood and David Corry , his brother had gone to the said Johnne McIlvane and With the aid of 11 persons ...with swords, ...had attacked the Earl and his servants, and had driven them to their lodging, had compelled the said Earl to barricade themselves. Moreover the said Johnne McIlvane and George and David Corry had proudly refused to obey the Earl's order that they should enter themselves in ward in Ivlaybole Tolbooth til they had found caution; and the said George Corry had proudly and avowedlie carried the said Johnne McIlvane and his said brother away with him from the Earl's billie-deputy. The said Johnne Mcllvean being present the Lords find the defenders have been guilty of a very great insolence and misbehavioure ..and commit the said Johnne McIlveane to the Tolbooth of Edinbllfgll, there to remain at his own expense till further order...They refuse the charge against the said Jolm Mcilvane for refusing to find caution, as the said Jolm has produced an act of Court of the Bailery of Carrick showing that tlle said Jolm and George Corrie of Kelwood as cautioner had acted themselves for Jolm Kennedy of Blairquhon and his household for 1,000 merks. 1613, Regular Council of Decreta. A substantial ruin located on the edge of Culzean Country Park, 1¼ miles (2 km) north of Kirkoswald in South Ayrshire, Thomaston Castle comprises a 16th century L-plan tower-house of three storeys. It would originally have had a garret above a corbelled-out parapet. The entrance was in the square stair tower which occupies the re-entrant angle between the two blocks. Recorded as Thomastoun on Johann Blaeu's Atlas of Scotland (1654), this tower-house was built within a 13th C. courtyard castle of some importance, which was said to have been built by Thomas Bruce, a nephew of Robert the Bruce (1274 - 1329). The property passed to the Corry family of Kelwood in 1507, and they built the tower. This includes a vaulted basement which once contained a kitchen and wine cellar. An arched pend through the basement of the SE-facing wing gave access to the former walled courtyard to the south. The hall was on the first floor, with bedrooms on the floor above. Around 1632, the castle passed by marriage to the MacIlvaines (or McElwain) of Grimmet and remained in use until c.1800. The ruins are B-listed and are a scheduled ancient monument.